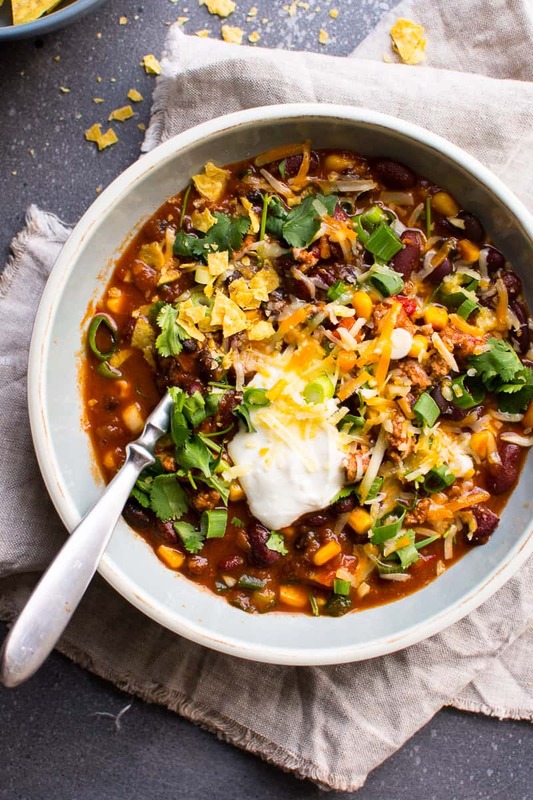 Instant Pot chili that tastes like it has been simmering on the stove all day. 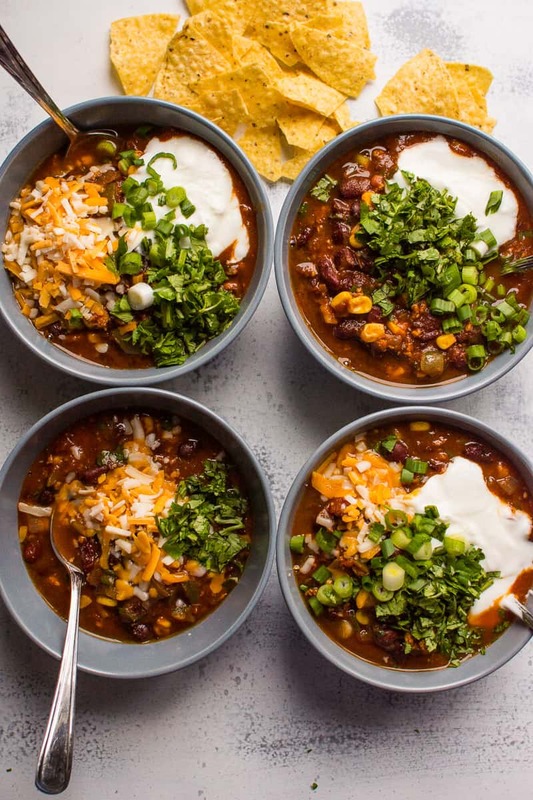 This flavorful, comforting and hearty bowl of homemade chili takes only 15 minutes to prepare and you can walk away. And it’s healthy made with ground turkey instead of beef. 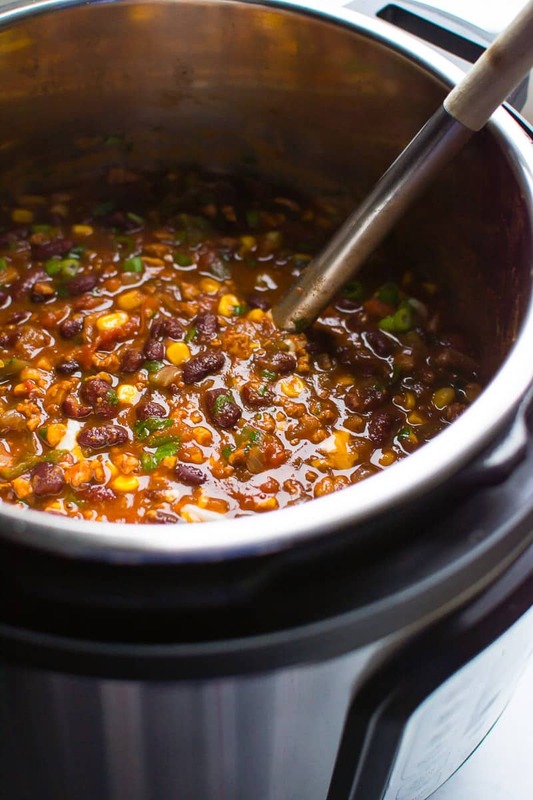 Why cook chili in Instant Pot? There is only a handful of recipes that make sense to be made in a pressure cooker. 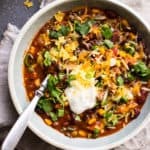 And easy Instant Pot chili is one of them. Because it’s EASY! I’m including 6 quart chili recipe and 8 quart ingredients as well (I own 8 quart IP-DUO). Use a combination of large meaty beans like red kidney beans, white beans or pinto beans. Always place tomato products on top to avoid “Burn” message. Do not stir chili in Instant Pot to further prevent “Burn” . Do not wait for ground turkey to brown. It never will in stainless steel pot and we just want separate pieces. I often use frozen vegetables like chopped pepper, corn and frozen cooked beans to save time. Pressure cooker chili thickens as it sits and keeps “cooking” even after Instant Pot turned off. Add smoked paprika for smoky flavor. If you like chili spicy, add 1/4 tsp red pepper flakes or 1-2 tsps hot sauce. 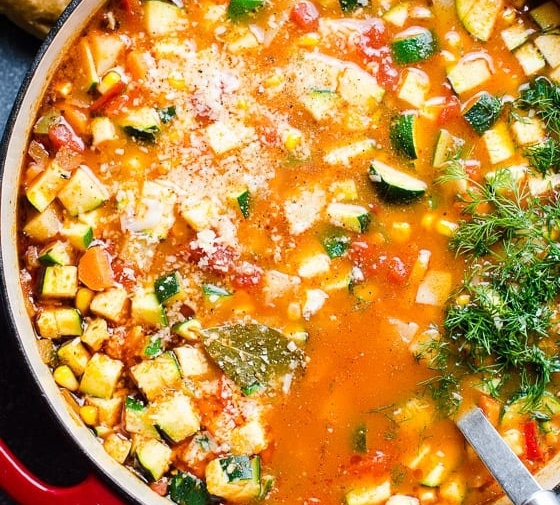 Release pressure outside to prevent your house smell like chili for days. I have used venison cut into small pieces many times instead of ground meat. Ignore chili bean setting. It’s just a factory preset. I use manual setting 100% of times. Saute ground turkey just enough to separate into small pieces. 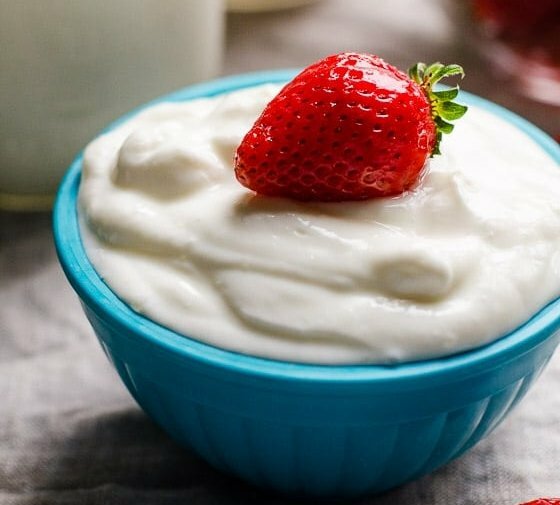 Add remaining ingredients in exact order listed in the recipe. Do not stir. 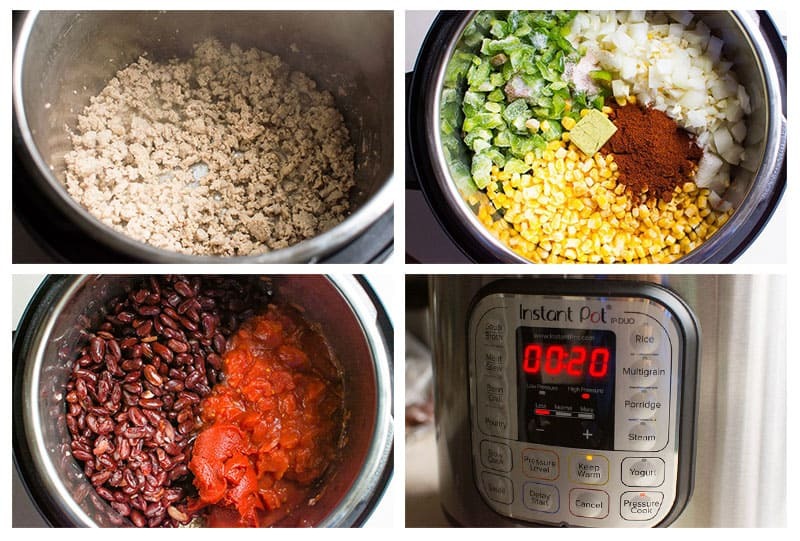 How long to cook chili in Instant Pot? Cook for for 20 minutes on high pressure. Then release pressure by turning pressure valve to Venting position right away. Or let pressure cooker come down naturally. Instant Pot turkey chili will be thicker that way too. Always add tomatoes on top and do not stir. Because Instant Pot’s heating element is located at the bottom and may cause sugars in tomato products caramelize and “burn”. Therefore, we add diced tomatoes and tomato paste on top and do not stir. You can also serve simple chili as an appetizer or over boiled (baked) potatoes. Instant Pot beef stew with a secret flavor boost at the end. 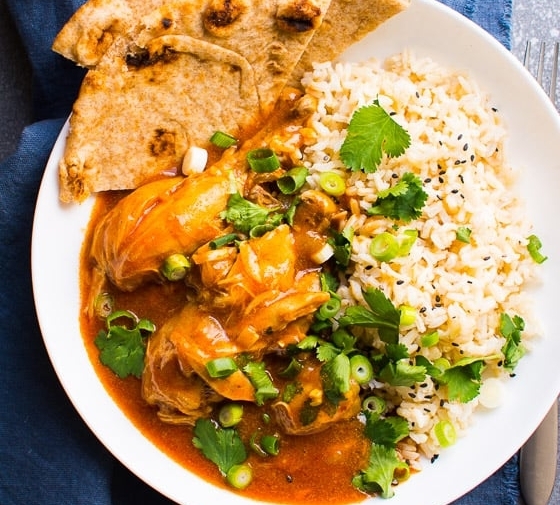 Buffalo chicken chili is just like eating healthy wings. Instant pot cabbage rolls – thank goodness no more rolling! Instant Pot chicken burritos that everyone is going crazy for! Want chili ASAP? 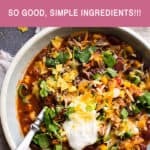 Make my Instant Pot Chili that will be on your dinner table in 1 hour. Tastes like has been simmering all day. On Instant Pot, press Sauté and let appliance preheat until display says Hot. Swirl a bit of oil to coat, add turkey and cook for 4 minutes, constantly breaking into small pieces with spatula. Meat won’t get browned and some pink pieces are OK – our goal is just to create small pieces of meat for every spoonful of chili. Add water + bouillon cube (stock), onion, garlic, pepper, corn, beans, chili powder, cumin, salt, diced tomatoes and tomato paste. Do not stir. Close the lid, set pressure vent to Sealing and press Cancel to turn Sauté off. Then press Pressure Cooking on High for 20 minutes. 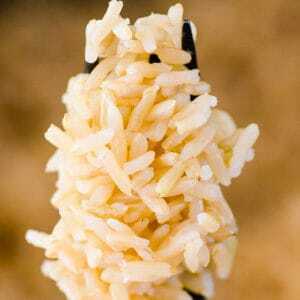 Display will say ON, Instant Pot will take about 20 minutes to come to pressure, you will see a bit of steam coming out from a valve, then float valve will rise and countdown from 20 minutes will begin. After 20 minutes, display will say OFF and Instant Pot needs to bring pressure down, which will be indicated by a dropped down float valve and takes about 20-30 minutes (Natural Release). I recommend you do it with chili as it will thicken and become more flavourful. OR you can do Quick Release (if you are in a rush) by turning pressure valve to Venting position, which takes 2-3 minutes. I recommend doing so outside to avoid smell and mess in the house. You can also increase cooking time to 30 minutes with Quick Release (if you have time). Open the lid, stir and serve hot with your favourite toppings. 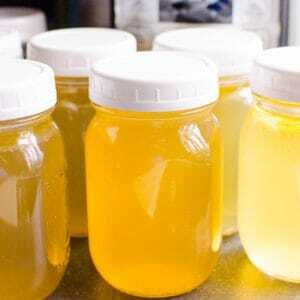 Try to find organic bouillon cubes. This amount of chili powder makes kid friendly mild one, use more to taste.